Zero day at Green Cove Motel! A zero day means you don't do any hiking and I didn't expect we would have any days like that on this trail. After the nightmare that was yesterday's hike we definitely needed a day off and we slept late. We fell asleep at about 9:30 last night and stayed in bed until 10 this morning. We wandered down to the store and poked around for a bit before the owner, Tubby, offered us some of her leftovers from dinner the night before. 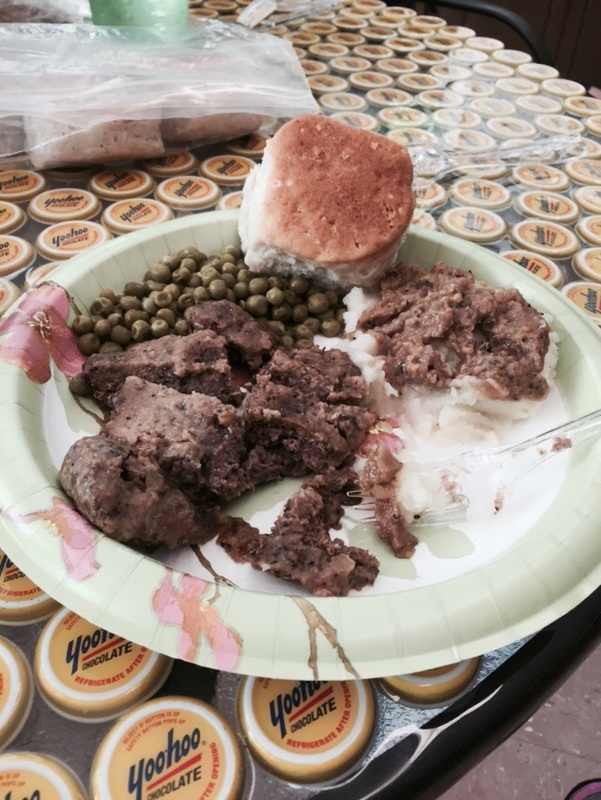 We had a huge breakfast of cube steak with country gravy, mashed potatoes, peas, and Mac and cheese. Tubby comes from a family of eight, so she always makes enough to feed an army she said. We sat with her for about an hour talking about just about everything before we left her alone for a while. Breakfast of champions on a cool table Tubby made from YooHoo caps. I made a few phone calls, the first to Rick and Brenda Harris - BMTA board members and maintenance directors. I asked about trail conditions coming up and Brenda assured me that our next section had been worked on very recently. She was aware of the condition of the trail we hiked yesterday and told me they were working on getting it cleared. Since we were in a wilderness area, they cannot use anything like chainsaws or weed whackers. The ranger district here is focusing on maintaining horse trails this year so the BMTA is kind of on their own. I then called the Tapoco Lodge and confirmed we would be there this weekend so we definitely would have a place to stay. Bloody and battered hiker legs from the tough day yesterday. We ate huge dinners and then lounged around the rest of the night. Even though there are no laundry facilities here, we were able to wash our clothes in the sink with a bar of soap and get them mostly dry for tomorrow. Laundry on this trail is few and far between! Drying laundry hiker style- chasing the sun around the parking lot! For anyone looking for a quiet, clean, relaxing place to get away I highly recommend Green Cove Motel. This place is out in the middle of absolutely nowhere. There is no TV or phone in the hotel rooms. No phone service works here. The windows and doors open up back onto the Tellico River and men are outside fishing all day long. I was telling NoKey this is how it must have been doing a long distance hike 30 years ago - walking nearly deserted roads to get to town, get a stack of quarters, and use the pay phone to call places. Tomorrow we go back into the woods with a guarantee of better trails and nice weather. It was been a perfect day off! Green Cove Motel- middle of nowhere and heaven on earth!